Photo by Brandon Macz: Seattle PrideFest director and head of the Capitol Hill Chamber of Commerce Egan Orion announced his campaign for Seattle City Council District 3 on Tuesday, April 2. 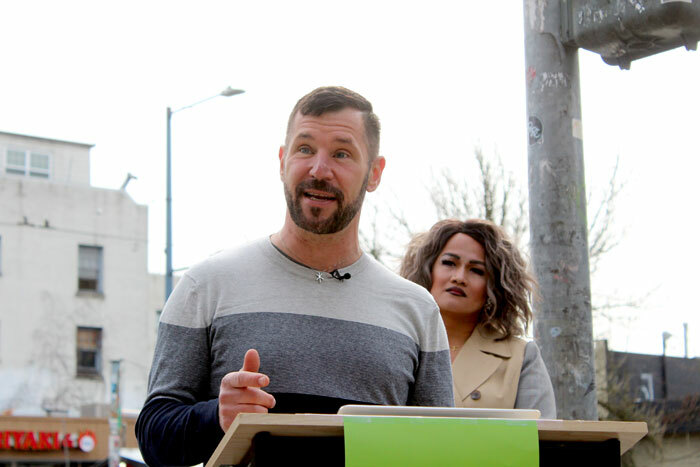 Seattle PrideFest and Capitol Hill Chamber of commerce executive director Egan Orion picked a corner on Broadway and Harrison, near an old apartment building his grandparents once lived in, to announce his campaign for the Seattle City Council District 3 seat. Like most candidates challenging two-term incumbent Kshama Sawant, Orion cites the councilmember’s lack of presence in the district as one motivation to run. “The citizens of District 3 deserve a representative who builds bridges, not burns them,” Orion said during his April 2 campaign announcement. Orion said his mother was conceived in Capitol Hill and raised in Mt. Baker. His parents moved to Auburn, and in the ‘90s Orion moved back to Capitol Hill after coming out as a gay man. It was a special and safe place, said Orion, who now owns a home in the Central District. He began producing Seattle’s pride festival 15 years ago, which grew out of his One Degree Events business, and in 2018 PrideFest took over organizing Capitol Hill’s pride festival when plans by the former organizer conflicted with neighborhood residents and businesses. The Capitol Hill Chamber of Commerce hired Orion on as a part-time executive director in March 2018, where he also leads the Broadway Business Improvement Area, which funds cleanup of trash, graffiti and drug needles along the commercial corridor seven days a week. Seattleites are facing high rents, struggles to make a living wage, and the hard decision about whether they can afford to raise a family here, Orion said, adding the city and Sawant have failed them. The District 3 candidate said the issues surrounding homelessness in Seattle can be broken down into three categories: shelter, mental health and addiction, and an affordability crisis. Orion said he supports community preference in affordable housing to keep people in their neighborhoods. He noted Capitol Hill Housing and Africatown’s recently opened Liberty Bank building in the Central District has an 87 percent black occupancy. He also wants the city to offer more short-term financial support for housing and free legal support to help people stay in their homes. Last year’s failed employee-hours tax was designed to increase funding for developing affordable housing and increasing support for homeless services by taxing businesses reporting more than $20 million in gross receipts. While Orion believes more money is needed for affordable housing and homeless services, he said it was clear in 2018 that the head tax was not going to survive a legal challenge. “It felt, to me, a little half-baked in the first place,” he said. Orion does believe Seattle voters are willing to pay more money to support worthy causes, he said. The head tax had been framed by Sawant as a tax on online retail giant Amazon. That company employs thousands of people in Seattle, Orion said, and he’d like those residents and stakeholders to be part of the solution, he said, but is willing to proceed without them if it comes to that. Orion said he does support developer impact fees like what Bellevue has, and would also support a progressive business-and-occupation tax increase on larger employers. The District 3 candidate said more shelter is needed for Seattle’s homeless population, pushing for beds on demand and trauma-informed care. The city needs to push the county and state for more funding now, he said. Seattle’s interim head of the Department of Human Services Jason Johnson earlier this year called for a pause on plans to open a fixed-mobile safe drug consumption site due to costs, as well as pending litigation in Philadelphia where a nonprofit is also attempting to open such a facility. But the city needs a comprehensive plan, he said. While such a facility would prevent someone in addiction from overdosing, there is still a person’s safety to consider once they leave. Orion disagrees with the message in KOMO’s “Seattle is Dying” special on the homeless crisis. He agrees that many Seattle law enforcement officers feel they have to also serve as social workers, which is not part of their training. He supports expanding programs that help police connect people with services and keep them out of the criminal justice system, such as the Law Enforcement Assisted Diversion program. Mayor Jenny Durkan introduced legislation earlier this year to offer a hiring bonus of up to $15,000 to help recruit and retain Seattle Police officers. Orion said the mayor has made it clear there are not enough officers currently, and he sees that in the East Precinct. “I think there’s a handful of police for a giant territory,” he said. Orion said he supports more officers on the streets, but he’s also cognizant that there are those, especially communities of color, that do not, and it’s important to find a balance. The District 3 candidate will continue running his businesses and leading the Capitol Hill Chamber of Commerce during his campaign, and he is already beginning work to qualify for Seattle’s Democracy Voucher program. His campaign website states Orion is also planning to add children to his family next year. Learn more about the candidate at eganforseattle.org.